Sarah Johnson lays out for a dig. 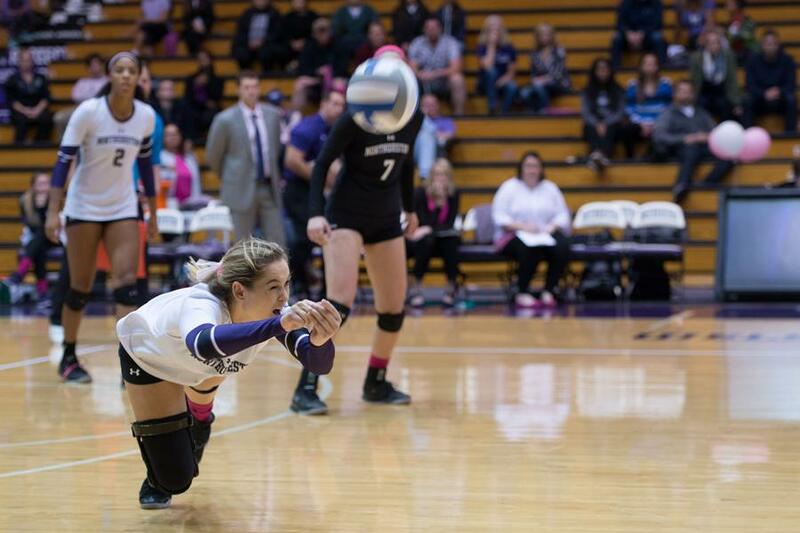 The freshman libero saw regular playing time for Northwestern this weekend, playing a role in the Wildcats’ first Big Ten win on Friday against No. 24 Purdue. Coach Shane Davis has finally earned his first Big Ten win. The Wildcats (8-14, 1-9 Big Ten) defeated No. 24 Purdue (13-8, 3-7) in Welsh-Ryan Arena on Friday, snapping their nine-game losing streak in four sets: 25-19, 18-25, 25-19, 28-26. For NU, the win came at the end of a five-game stretch against ranked teams. After starting his first season as the Cats’ coach with four straight wins, Davis’ team lost 13 out of its next 16 matches while heading into the matchup against the Boilermakers. During that strenuous stretch, NU was swept nine times, often being overwhelmed by their opponents’ size at the net. But although Purdue exhibited the length that had previously given the Cats trouble, NU was able to provide a blocking presence of its own, neutralizing the Boilermakers’ secondary attacking threats and giving the Cats a chance to take down a ranked Big Ten team. NU was also able to put together a solid defensive performance. Freshman Sarah Johnson started at libero for the Cats, who have been missing sophomore libero Katie Kniep since Oct. 5 due to a back injury. After Kniep’s injury, senior outside hitter Rafae Strobos played the libero position for the team until Johnson stepped in. Johnson finished the match with 14 digs, a team best. Strobos added seven digs and an ace. Johnson said the team’s focus on its gameplan helped lead it to a first Big Ten win. NU also exhibited a balanced attack. Five players tallied four or more kills, including junior outside hitter Symone Abbott, who had 18 kills, and senior outside Sofia Lavin, who notched nine of her own. Lavin said the Cats’ persistence and confidence during high-pressure moments was crucial to the victory. NU had a quick turnaround, facing Indiana on Sunday. The Cats lost their first meeting with the Hoosiers on Sept. 21, and they were unable to avenge that defeat, losing in three sets: 25-23, 27-25, 25-19. Although it was the eighth sweep in the past nine matches for the team, Sunday’s contest was as competitive a match as NU has recently seen. Still, the team’s mental lapses allowed the Hoosiers to take control toward the conclusions of each of the sets. In particular, the Cats’ inability to consistently serve proved to be too much to overcome. The team tallied 25 service errors throughout both of the weekend’s matches, including 12 against Indiana. Although NU struggled with its serving, it demonstrated a balanced offensive attack that it hadn’t before this weekend’s matches. The team had five players with four or more kills in Sunday’s match. Davis said the offensive improvement is the result of the Cats’ having searched for their best lineups on the court.